undergraduate degree programs in Computer Science (2013), Software Engineering (2014) and Computer Engineering (2016). "This report does not seek to endorse the lecture format. Even though we have used a metric with its roots in a classical, lecture-oriented form, we believe that other styles can be at least as effective, particularly given recent improvements in educational technology. These include forms such as flipped classrooms, massive open online courses (MOOCs), blended learning, pre-recorded lectures, and seminars. For some of these styles, the notion of hours may be difficult to apply. Even so, the time specifications serve as a comparative metric, in the sense that five core hours will presumably take approximately five times as much time or effort to address as one core-hour, independent of the teaching style. " "Permanent faculty, whose primary criteria for evaluation is based on teaching and educational contributions (broadly defined), can be instrumental in helping to build accessible courses, engage in curricular experimentation and revision, and provide outreach efforts to bring more students into the discipline." "While research universities have traditionally drawn on postgraduate students to serve as teaching assistants in the undergraduate curriculum, over the past 20 years growing numbers of departments have found it valuable to engage advanced undergraduates as teaching assistants in introductory computing courses. The reported benefits to the undergraduate teaching assistants include learning the material themselves when they are put in the role of helping teach it to someone else, better time management, improved ability dealing with organizational responsibilities, and presentation skills [4, 6]. Students in the introductory courses also benefit by having a larger course staff available, more accessible staff, and getting assistance from a “near-peer,” someone with a recent familiarity in the kind of questions and struggles the student is likely facing." In Part 4 I looked at combining VET and university teaching. However, before considering any new qualifications, what industry certifications are there? There are Microsoft Certified Trainers (MCTs) to specifically teach about Microsoft products. These trainers need to have a Microsoft Certification in a subject area, plus "one year of instructional experience", and an instructional skills certification. CTT+ distinguishes between virtual and classroom based training. IAMCT ATT requires a three day face-to-face course. The Netcom Learning CompTIA CTT+ Certification requires a 5 day (40 hour) course. This suggests that the MCT could be compared to a form of Australian VET certificate. Western Civilization Under Threat from the Liberal Arts? A Liberal arts college is a largely American form of institution, offering a small campus and first degrees in arts, humanities and social science. However, I suggest that we need a new creative class who have vocational and very technical skills, to continue to create wealth in western nations. Campion claims to be the "first Liberal Arts College in Australia" offering a Bachelor of Arts (Liberal Arts), a Diploma of Liberal Arts (Foundations of the Western Tradition) and a Diploma of Classical Languages. However, several of Australia's universities already offer liberal arts programs and theological studies, most notably the Australian Catholic University, (while also offering vocational and postgraduate degrees). For four years I have been a student of education in North America and as part of this have been participating in on-line forums with education academics from around the world. One curious aspect of this was a number of academics from liberal arts colleges in the USA arguing how they provided an education which was a good basis for employment, but lamenting employers did not recognize this. I had difficulty understanding what they were talking about. My educational studies have been focused on students learning the skills they need for a vocation. This is very clear in my field of computing, where there is broad agreement on what a computer professional needs to know. My job as an educational designer is to translate these requirements into something which can be learned and assessed. The set of skills to be acquired have been agreed with industry, so provided I can show my students have the skills, they will have jobs. What confused me about the liberal arts college academics approach was that they never seemed to be clear as to what jobs they were educating students for. Simply asking the academics did not produce a useful result. In looking at this further, the reason for the confusion became clear: a liberal arts college is not aiming to produce graduates for a vocation, but a broad knowledge, especially the arts and humanities. Sheridan points out that many liberal arts graduates go on to postgraduate study at a "big university" and many "ended up in journalism". However, there are specialized undergraduate degrees for vocations such as journalism and Australian universities offer integrated undergraduate/postgraduate programs. In the past, when few people went to university, a degree (any degree) would be an advantage when applying for a job. However, an era when many people have degrees, employers can short list those people with qualifications relevant to a job. In this jobs market, having a generalist degree will be of little value and may be a disadvantage. A student who has studied the "Western Tradition" may not only be unqualified to do anything particular job, but also be a liability when working in multinational companies doing business in Asia. The Bologna model, adopted by some Australian universities, has the student undertake a more general undergraduate degree, then Masters specialization. The University of Melbourne took this a stage further with the Melbourne Curriculum. However, even Melbourne still offers specialized vocational first degrees, not just a general degree. Australian universities are competing globally for international students and will, over the next few years, increasingly competing globally for domestic Australian students. As education moves on-line, Australian institutions will need to offer courses attractive to students. I expect 80% of higher education will be on-line by 2020) and students will be able to study anywhere. Offering students a Liberal Arts qualification in the "Western Tradition" is not going to be very attractive for students requiring specific vocational skills for a global workplace. In "The hipster is dead, and you might not like who comes next"
David Infante (Mashable Australia, Jun 09, 2015), describes himself as a writer who "studied liberal arts in college". Lightheartedly describing himself as part of the “creative class", he coins the term "yuccie" to describe those who want to get rich quick but preserve their creative autonomy. However, I suggest that the creative class now needs specialized skills. Entrepreneurs can be trained in Innovation Workshops. The app infrastructure depends on highly trained computer professionals. This year I have been helping with innovation education: for a new creative class. The VET Student Loans Act 2016 makes illegal the use of broker or agents to arrange student enrollments as of 1 January 2017. This contrasts with the university sector, where the Australian government promotes the use of Education agents on its Study in Australia website and promotes the Education Agent Training Course (EATC) from International Education Services. Perhaps a similar regulatory approach is needed for the VET sector, rather than an outright ban on agents. I suggest the aim should be ensure that the same procedures are followed, regardless of if the student recruitment is undertaken by the institution's staff, or a contracted third party. (e) assist, or provide support for, students who could be eligible for a VET student loan for the course to complete any assessments required to show that students are academically suited to undertake the course. (b) specified in the rules. Note: Employees of approved course providers will be covered by other requirements that apply to approved course providers." How Open is Australian Higher Education? The e-book of "Open Education: International Perspectives in Higher Education", edited by Patrick Blessinger and TJ Bliss is available free in PDF and HTML. In Chapter 6 "Educational Policy and Open Educational Practice in Australian Higher Education", Adrian Stagg and Carina Bossu give a not very glowing report card. The authors note that low socio-economic background students at university increased only 1.29% from 2001 to 2014. Regional university students have fared slightly better, increasing from 15.4% (2001) to 19.3% in 2014. However, it should be noted that Stagg and Bossu do not include students in Vocational Education and Training (VET, which make up a significant part of Australian Higher Education. The VET sector has the potential to better address equity issues than universities. Stagg and Bossu point to the Australian National Data Service (ANDS) and the use of Creative Commons licenses by universities as examples of open access policies. They suggest OER policies can have benefits for institutions, such as improved reputation by showcasing educational content and techniques. However, the authors do not explain what the benefits would be for individual academics who's promotions are based on how much research and course revenue they can bring in. Some vague improvement in reputation makes a weak case compared to revenue from students paying for courses using proprietary materials. Stagg and Bossu try to make a case for Open Education in terms of access and equity. However, they do not really make the case for openness translating into access. Also the authors fail to address the motivations of individual academics and of institutional government policy. Most of those teaching in Australian universities are on short term contracts: how will they earn a living through Open Education? The few permanent long term academics in universities also need to meet financial targets from their research and teaching. Education is a major export industry for Australia: how can this income be increased through Open Education? I suggest that Open Education will not advance by simply ignoring this reality. A case can be made for Open Education enhancing individual careers and national education exports. However, Stagg and Bossu have not made that case. A recent item in the journal Nature (Sharples, 2016) listed Athabasca University (AU) in Canada, as one of four institutions worldwide pioneering global open education . A few weeks ago I completed a Master of Education in Distance Education (MEd DE) at the AU Centre for Distance Education. I selected Athabasca because they have more than two decades of experience specializing in using e-learning to teach how to do global on-line education. Now I intend to use what I have learned to help move Australian Higher Education on-line by the end of the decade. The AU MEd took just over three years, part-time, entirely on-line. Mostly I completed one course per term, three terms per year. For two terms I did two courses at a time, but this was very hard work and not a practice I would recommend. During my studies I created 2,291 files totaling 458 MB on my laptop computer. In addition I created twelve Mahara on-line journals to record my private reflections: one for the program and one for each course, with about one hundred postings in each (1,200 postings in total, made up of about 100,000 words). Keeping a private journal was a good way to keep notes for use in contributions to course forums (which are assessed) and for my e-portfolio (discussed later). While AU recommends the Microsoft Office suite, I found the free open source Libre Office was an adequate substitute. One paid application I found useful was the Grammarly grammar checker. AU also provided access to Moodle, where most course notes were provided, text based interactions took place and assignments were submitted. Access to Mahara was provided for preparing an e-portfolio (I also used Mahara for my private journals). Adobe Connect was provided for synchronous (real time) audio "webinars" and for presentation of the capstone e-portfolio. Moodle, Mahara and Connect were adequate. My wireless modem running (at times) at 256 kbps, was adequate to undertake the course. Mobile learning and Distance Education. In a webinar at the end of the program I presented my e-portfolio and then spent thirty minutes answering questions. This was a nerve racking process, much as it would have been in a face-to-face session. For just over three years I worked on-line with Athabasca students, mostly in Canada, but also in Europe and Asia. I was the only Australian in my student cohort and at times it felt a little lonely. However, I had the pleasure of meeting two of my professors face-to-face, when they were a key part of international education conferences. Rory McGreal was a keynote speaker at ICOFE 2015 in Hong Kong. Agnieszka Palalas is President of the International Association for Mobile Learning (IamLearn), which ran mLearn 2016 in Sydney. Unlike Australia masters programs, which segregate "coursework" and "research" students, all AU MEd students first enroll in a common program, undertake core courses and only then choose a thesis (research) or e-portfolio (coursework). I started with the intention to do quantitative research. However, after completing the core courses, I decided on project-based coursework (as discussed in my e-portfolio). During my studies, the program changed to incorporate a larger capstone electronic portfolio. This changed from being something tacked on the end of the program, to a semester long course in itself. As one of the students during the transition, I had the choice of either option. Fortunately I chose the full course option, as preparing an e-portfolio proved to be surprisingly difficult. AU is still refining this process, and more scaffolding (treating the e-portfolio as a series of assignments) I suggest would help. One of the most useful aspects of the AU MEd was studying while also working in the field. Like my fellow students I am an experienced teacher and could not only bring that experience to the courses, but also immediately apply what I was learning. As part of the MEd, I updated my ICT Sustainability course, designed an on-line innovation course. Also I produced two conference papers (on e-learning for Asia and a new e-learning paradigm). Part of studying in this way is the increased confidence which comes from learning by doing. I have been able to help students preparing their e-portfolios for ANU Techlauncher. program, as not only had I learned the education theory, but also prepared an e-portfolio in practice. My intention is to continue to put what I have learned into practice, helping Australian universities move their education on-line, using group work, peer assessment, and e-portfolios. Most higher education in Australia will, I suggest, be provided via some form of e-learning by the late 2010s. This is not suggest that classrooms and campuses are obsolete, but that most students will study by blended learning, with the blend about 80% on-line and 20% in a classroom. The difficult part of this transition will not be technology: Australia and New Zealand are world leaders with the Moodle learning management system and Mahara e-portfolio package (both available free). The problem is to educate tens of thousands of academics in effective teaching techniques and to convince more senior academics that this is a valid form of education. I hope to be able to assist with this, by having teaching recognized as a specialization for computer professionals, so we can then lead the e-learning revolution. The Athabasca University MEd (DE) courses were very similar in format to the on-line courses I had taken at USQ and run for the Australian Computer Society and ANU. To this AU added the capstone e-portfolio. This format works well for students who are mature, motivated career professionals. Four terms a year: Doing more than one course at a time greatly increases the difficulty of study. To increase the rate of completion, I suggest four terms a year. Having a long "summer" holiday makes little sense for working part-time students around the world. Quizzes: Learning management systems have provision for automated quizzes. These are useful to help the student learn the basics. A quiz each week for a small number of marks (1%) helps keep students studying. Peer Assessed Forums: Having a small amount of marks (10%) for student contributions to forums is useful. However, this is a burden for instructors to mark. I suggest having peer assessment using the in-built LMS feature for this. Allow Instructors to Update Materials: Minor corrections will need to be made to course materials during a course, particularly correcting broken hypertext links. Instructors should be given access to the LMS to make these changes without having to refer them to administrative staff. Use e-Portfolio in All Courses: An e-portfolio is a powerful learning technique, but one which is very difficult to master. I suggest having the students start on e-portfolios in the introductory course, including the practice of peer review. This then could be used in all courses. Address MOOCs: The MEd syllabus concerns conventional on-line distance education courses. There needs to be some mention of other formats, particularly MOOCs. Instructional designers need to learn how to face the question of: why do we need you to design and run a course when we can get a MOOC for free? Introduce Assessment: What is an "average" grade needs to be explained to students. This is so students, particularly international students, can have reasonable expectations. Scale Fees: Athabasca's fees for international students are less than an Australian student pays for a domestic Australian program. Increasing the fees, where a student can afford to pay, would allow the university to pay for more instructor time and also help ensure the financial viability of the institution. Athabasca already has a form of fees for different regions, with students from Greece and Eastern Europe paying a lower rate for the course through the Eastern Macedonia and Thrace Institute of Technology. Hoven D. (2015, January 7). ePortfolios in Post-Secondary Education: An Alternate Approach to Assessment. UAE Journal of Educational Technology and eLearning. Edition 1. Sharples, Mike. (2016, December 15). Digital education: Pedagogy online, Nature. The Bill & Melinda Gates Foundation has released the 36 page report "Teachers Know Best" along with a two page summary "How Teachers Approach Data". The report advocates the use of "... student data to tailor and improve instruction for individual students..." (p. cov2). Such an approach, I suggest, may do more harm than good, by diverting resources away from the design of quality instructional materials and by setting unrealistic expectation as to the level of tailoring possible with the resources available to teachers. The report divided teachers into Data Marvens 28%, Growth Seekers 20%, Aspirational users 17%, Scorekeepers 11 %, Perceptives 14 %, and Traditionalistss 10%. The report's authors clearly believe that the marven's data-driven personalized instruction is preferable. However, where are teachers going to get the data and will they be given the time to personalize student's instruction? Assuming no more resources are provided, the funding to provide data analysis tools will come from the education budget and reduce resources for course materials. Similarly, more time by teachers taken on a personalized approach will result in lass time for class teaching. I suggest what is instead required is instructional design, which individual teachers do not have the time or resources to do. Statistical analysis can be used to crunch the numbers on large numbers of students to see what educationally works and what does not work and what aspects of subjects students have difficulty with. These insights can be built into the educational materials and teacher training. Teaching can be given help in identifying what students will have difficulty with and how to help them. But each teacher does not need to become a statistician to do this. There are ways to use personalized learning to help students. However, it also has to be done in a way which helps teachers and is affordable. As an example, last year I used peer assessment in my ICT Sustainability course. This helps students, as by having to assess their peer's work, students gain insight about their own work. As a by-product this reduces the assessment load of the teacher (and also reduces student appeals, as students are less likely to object to the marks their peers give). The Australian National Audit Office has issued a 68 page report on the Administration of the VET FEE-HELP Scheme (December 20, 2016). The Auditor found "The VFH scheme was not effectively designed or administered. Poor design and a lack of monitoring and control led to costs blowing out even though participation forecasts were not achieved and insufficient protection was provided to vulnerable students from some unscrupulous private training organisations." (page 8). A new VET Student Loans scheme, designed to address deficiencies in the old one, starts1 January 2017. Unfortunately it took the government several years to act, resulting in billions of dollars wasted. It will be interesting to see if similar reforms are introduced to the university student loan scheme, which has some of the same deficiencies as the old VET scheme. In particular, education providers are permitted to offer university degree programs for which there are no jobs. 7. The VFH scheme was not effectively designed or administered. Poor design and a lack of monitoring and control led to costs blowing out even though participation forecasts were not achieved and insufficient protection was provided to vulnerable students from some unscrupulous private training organisations. 8. The design of the expanded VFH scheme in 2012 was weighted heavily towards supporting growth in the VET sector, but an appropriate quality and accountability framework addressing identified risks was not put in place. As the responsible department, Education did not establish processes to ensure that all objectives, risks and consequences were managed in implementing the expanded scheme. In effect, the department’s focus on increasing participation overrode integrity and accountability considerations that would have been expected given the inherent risks. The department inadequately considered the implications of the changed incentives facing providers and students in the expanded scheme and its role in ensuring effective regulation in conjunction with other regulators—principally the Australian Skills Quality Authority and the Australian Competition and Consumer Commission. There was also a lack of data analytics capability in Education and little internal management reporting or analysis of the VFH scheme to identify emerging problems. The department did not develop measures to assess broader objectives of the scheme (beyond growth) including those related to value and quality in the VET sector. In redesigning the VFH scheme, insufficient regard was given to relevant experiences in other jurisdictions, particularly Victoria, and the risks identified in a Regulation Impact Statement. 9. The administration of the VFH scheme did not safeguard its operation, and did not support the achievement of objectives relating to integrity, quality, value and sustainability. Similar to the scheme’s design and implementation failures, there were weaknesses in Education’s administrative processes for: approving VFH providers; developing and undertaking risk, fraud and compliance activities; controlling payments to providers; making information readily available to students about their rights and obligations under the VFH scheme; and managing and resolving student complaints. While improvements were made to many of these processes in 2016, the initiatives were in place for a relatively short period of time prior to the cessation of the VFH scheme from 31 December 2016." From Administration of the VET FEE-HELP Scheme , page 8, Australian National Audit Office, December 20, 2016. EduGrowth is new peak body for the EdTech sector: that is start-up companies selling mostly on-line services and products for education. WeWork provide co-working office space around the world (mostly the USA), with two locations in Sydney. The new location in Pyrmont is in an old wool store which has been renovated in the classic start-up style, with old wooden beams and ceilings retrained, plus retro style steel fittings. There is an extensive bar provided and some interesting touches, such as "telephone boxes" for making private calls and cafe booths for intimate meetings. OpenLearning provide an on-line learning system using what they call "social media workflow". The company came to prominence when they arranged with the Malaysian government to provide the platform for Malaysian university on-line courses (with 59 courses so far). OpenLearning also have a "Pay for Certification" offering with Hunter TAFE. The idea seems to be you do the courses on-line for free and then pay to receive the formal certification. This is not as radical as it sounds, as the VET sector has previously provided Recognition of Prior Learning (RPL). I obtained a Certificate IV in Training and Assessment through Canberra Institute of Technology, with 80% through RPL and the rest some on-line learning and assessment. The OpenLearning/Hunter Cert IV T&A is more than twice the cost I paid for CIT certification. The EduGrowt­h Christmas Party is Thursday, December 15, 2016 in Sydney. EduGrowth is an accelerator network for the education sector. "The pioneers are universities committed to global open education, such as the Open University in Milton Keynes, UK; the Massachusetts Institute of Technology in Cambridge; Canada's Athabasca University; and the University of Cape Town in South Africa. The most traditional universities are finding this step the hardest." Interestingly, only one of these universities is in the USA (MIT). I am a student of education at Athabasca University, and while it is mentioned frequently in e-learning research publications, it rarely gets a mention in the specialist education press and almost never in the popular media. Sharples points out that "... the education system in transition from campus instruction to global enterprise ...". Some academics may fear this, seeing it as a move to the commercialization and commoditization of learning. However, what the open university have show is that it is possible to provide a quality education at a lower cost to more people. This is not about fancy software or replacing lectures with videos, it is about careful design of education. 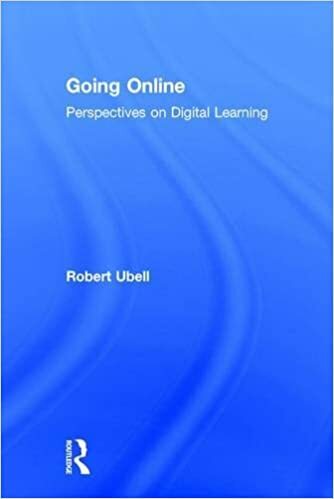 Writing in Inside Higher ED, Robert Ubell, lists reasons "Why Faculty Still Don’t Want to Teach Online". However, I suggest one reason is that academics are mostly not trained in how to teach on-line and so are not surprisingly reluctant to do so. The production line revolutionized the manufacture of cars. What is usually emphasized is the efficiency brought about by production line workers carrying out repetitive tasks. What is not highlighted is the large team of highly trained engineers who not only design cars for mass production, but also the production and quality control process. The result is not only cars which are much cheaper than those made by hand, but also vehicles which are more reliable, more efficient and of much higher quality. The same thinking is used by on-line and distance universities, who use teams of educational design specialists, working with subject matter experts to produce efficient, low cost courses. This is something which academics without training in course design will naturally find threatening. This is not to suggest all education will be like a robotic factory. Modern car plants use a combination of robots and human workers. Even bespoke luxury cars from Rolls-Royce and Bentley are produced on production lines. In the same way education will be a combination of automated e-learning and hand on human tutoring, with the blend depending on need (and what the student can pay for). In Part 3 I looked at the carefully thought out set of teaching qualifications for the Vocational Education and Training Sector (VET). One approach to the university sector would be to start with those who had completed a VET qualification and then add whatever else they might need. However, this might not be attractive, or useful, for someone who already has a degree in computing. Requiring a VET qualification may discourage computing professionals from studying teaching. An alternative approach would be to have a graduate university program which also met the VET requirements. This would also be useful as the student could look at requirements for the two sectors as part of their studies. CQ University advise that their CertificateIV in Training and Assessment requires about 270 hours of study. This is approximately one half the time for a postgraduate certificate. So it would be reasonable to incorporate the material required for a Cert IV in a Graduate Certificate. One approach which could be used is to teach the students using the tools and techniques they are learning about as subject matter. As an example, students could prepare an e-portfolio as part of learning about e-portfolios as a teaching tool. The students would learn about Recognition of Prior Learning (RPL) as an educational topic and also present evidence, via the e-portfolio, for RPL. Speak at ACS Canberra e-Learning Sig in 2017? This is to invite speakers for the Australian Computer Society Canberra Branch Electronic Learning Special Interest Group (ACS e-Learning SIG) in 2017. Meetings are held 5pm to 7pm on Wednesdays each quarter at the ACS Canberra Branch office in Deakin. Meetings are scheduled for 2017: 22 February, 24 May, 19 July and 11 October. Learning to Teach On-line, Tom Worthington, Australian National University, November 2016. The format for the ACS e-Learning SIG is that the guest speaks for five to ten minutes then there are questions and discussion. Lecture style presentations are discouraged. Please contact one of the co-chairs: Tom Worthington or Chris Johnson. While in Vancouver for a computer education conference in 2014, I dropped in on Philippe Kuchen at UBC Electrical and Computer Engineering. He pointed out that they have engineering and business students work together in a "New Venture Design" course (APSC 486) and I suggested ANU do something similar in Canberra. The ANU Techlauncher program was set up by expanding the previous software group projects, to include the option of a start-up. This has now been running successfully for two years, however the great range of projects (startups, projects for established companies and for government agencies) can make supervision and assessment difficult. Currently assessment is based on the student's group performance and on assessment of an e-portfolio. Students have difficulty writing a personal e-portfolio, having spent years writing in the third person and about group work. The Simon Initiative at Carnegie Mellon University suggests addressing the problems of group work by assessing the individual, as well as the group, and assess process. They also suggest peer and self-evaluations. The University of Sydney, Faculty of Education and Social Work, provide a Group Work Guide, which discusses evaluation and reflection. The University's course 6112 Entrepreneurship and Business Innovation, includes peer assessment of group contribution. Andrew Cain suggests the use of constructive alignment with portfolio assessment, for software students, to provide deeper learning. Most of these courses have learning outcomes aligned with the accreditation requirements of Engineering Australia and the Australian Computer Society (COMP8715 and COMP3710 are general purpose project courses). "Work as an effective member of a team to implement a software based solution that delivers measurable value to an industry or university client. Develop life-long learning through reflection, as demonstrated through continual reflection on the software development lifecycle and team work processes experienced throughout the year. Exhibit an awareness of- team formation strategies and stages leading to the development of high performing, self-managing teams;- sound meeting practice; and- how personality traits can impact upon team performance and how to use individual traits to achieve the most from team work. Make and defend sound engineering decisions. Communicate effectively, orally and in writing, with peers, supervisors and commercial clients/stakeholders. Creatively identify and implement a solution to a complex problem that exists within the domain of ICT. Participate effectively in project and artefact reviews with peers, supervisors and clients/stakeholders. Explain the role and importance of project management, configuration and risk management processes when undertaking a software development project. Demonstrate experience in undertaking the activities associated with these. Explain and understand the importance of the different stages of, and activities associated with each, the software development lifecycle (SDLC). Demonstrate experience in all stages of the SDLC. Explain the role and importance of standards in software development. Demonstrate experience in tailoring those standards approriately [sic] according to the project they are currently undertaking. Participate in a group presentation, including a demonstration, to an audience of peers, clients and supervisors." "Work as an effective team manager of a small team of peers to implement a software based solution that delivers measurable value to an industry or university client." Work as an effective member of a team to implement develop a software based solution that is innovative and delivers measurable value to an industry or university client. identification of the value that the design team can offer (through understanding the relationship between the potential users’ needs and the constraints of those who will ultimately be asked to pay the costs of the proposed solutions, as well as by considering how a potential solution may ultimately be brought to market or otherwise to implementation). project planning – laying out a reasonable timeline, identifying and assigning responsibilities for different tasks to different team members. interface definition – explicitly identifying and documenting how each member’s or sub-team’s responsibilities connect with those of the other members or sub-teams. development and use of proper project documentation – students are acquainted with ISO 9000-type quality control regulations and use similar (though likely simplified) versions of these regulations in their own projects. familiarization with the use of standards and associated regulatory and liability considerations – the Senior Chairholder has significant experience with safety-critical systems and has negotiated an accord with the Canadian Standards Association (Canada’s representative to ISO) to make important standards available to faculty members and students. The Associate Chairholder is working with instructors in the graduate Biomedical Engineering program who are trained in medical regulatory issues to integrate these considerations into his current graduate courses. regular team communication – use of concurrent engineering approaches to ensure that issues relevant to and with implications for other team members are identified early and communicated clearly both amongst the team and to the faculty advisors and clients. familiarization with key prototyping technologies relevant to each discipline (e.g., for mechanical engineers, this involves rapid prototyping processes such as water-jet cutting, bending machines, spot welding, stereo-lithography machines, etc; for electrical engineers, this involves working with FPGAs or CAD-based circuit designers and simulators). quantitative reasoning – an emphasis on the use of prediction early in the design process, based on analytical models, simulations, experiments or prototype development and testing." The difference here is that ANU includes life-long learning and reflection. UBC has more on the value process as well as technical standards and also has its own Strategic Design Method. The description of ANU's Comp3500 has a Mapping of Learning Outcomes to Assessment and Professional Competencies. This maps the course Learning Outcomes and the assessment items to the compliances required by the ACS and Engineers Australia. Learning Outcome 2 "Develop life-long learning through reflection ...", is unusual, as it is assessed through just one assessment item (number 5), an individual reflective learning portfolio (30% of the total assessment). This is also unusual as the Learning Outcome does not map to any ACS Software Engineering Areas (whereas it maps to several Engineers Australia areas). The SFIA framework used by ACS does mention education. However these are skills for educators who help others with their learning, not self directed learning. This is perhaps something which needs to be added to the framework, as being able to learn is an essential skill for any professional. StartupAUS have released a 182 page "Crossroads 2016 Report: An action plan to develop a vibrant tech startup ecosystem in Australia" (Colin Kinner, November 2016). Five of the recommendations relate to education. Curiously, the first of these, "Extend the Digital Technologies Curriculum", is listed under theme 5, whereas the others are under theme 6. The recommendation to extend the Digital Technologies Curriculum to be an elective in years 11 and 12, is reasonable. But making it mandatory for years 9 and 10, might be difficult to implement and counterproductive. Implement entrepreneurship programs in all Australian primary and secondary schools is, I suggest, unrealistic. However, entrepreneurship programs in all Australian universities is feasible. However, this might be better implemented at a regional level, and also should be extended to the Vocational Education and Training (VET) sector, not just universities. Canberra does this well, with local government and higher education institutions jointly running the Canberra Innovation Network (CBRIN), located in the center of the city's innovation district. It is not clear why Startup Scholarships should be limited just to STEM graduates, or that "immersing" students in the startup hubs of other countries would be cost effective. Students from the creative industries should also be included and the on-line option should be explored. Students can learn to work together on-line, and this learning can be cost-effective, using peer-assessment and e-portfolios. What is missing from the report is the use of on-line technology to provide the educational initiatives. There appears to be a contradiction inherent in the report and in start-up mythology, that "disruptive" on-line products can only be produced by people in close physical proximity talking face-to-face and using bits of paper. Perhaps it is time that the start-up industry was itself "disrupted". ps: Unfortunately, at 42 Mbytes, this took a long time to download with my wireless modem. StartupAUS might like to use responsive web design, rather than last-millennium PDF. Extend Vocational Education Reforms to Australian Universities? limit the subcontracting of training to stop providers ‘selling access’ to higher-fee loans arrangements to training organisations that don’t meet the higher bar to qualify." It will be interesting to see if the government brings in similar reforms for the university sector, which has its own loans scheme on which the failed VET scheme was based. While there is not the same level of misuse of the university scheme apparent, there is currently no requirement for university programs to align with industry need. If students were also required to undertake Higher Education in smaller increments (first a month long VET Cert IV, then a six month university Certificate, followed by university programs each of no more than two years) these measures would reduce cost and boost completion rates. In Part 2' I looked at what standards professional bodies have for IT teaching. The Australian Vocational Education and Training (VET) sector also has a carefully thought out set of teaching qualifications underpinning the way training is provided. The Companion volume implementation guide for TAE Training and Education Training Package (Release 2.0, April 2016), provides details. Unpinning the VET system is the Certificate IV in Training and Assessment (TAE40116), which a VET teacher will most commonly have. Above this are the Diploma of Vocational Education and Training (TAE50116 ), Diploma of Training Design and Development (TAE50216) and the Graduate Certificate in Digital Education (TAE80316). The Cert IV is intended for both VET and Enterprise Trainers and Assessors, the Diploma for VET Trainers and Assessors, and the Grad Cert is intended for Tertiary, secondary and primary teachers. The Dip TDD, is intended for Instructional Designers in all sectors. The Cert IV, Dip TDD and Grad Cert appear most applicable to IT professionals. The number of institutions offering these qualification drops off sharply as the level increases: Cert IV T&A (643), Dip VET (140), Dip TD & D (115) and the Grad Cert DE (8). In Part 1 I considered if we should have more IT professionals, trained to teach part time. But what standards and qualifications could be applied to such teaching? From ACS Certified Professional Pathway Chart (2013). As I noted in my presentation to the Computing Education Conventicle 2016, there are twelve education and training related skills defined in the Skills Framework for the Information Age (SFIA). SFIA is used by the ACS in Australia to define what IT people do and so this recognizes education as legitimate role for IT professionals. The skills range from level three (the beginner level) to level seven (the highest skill level). The skills are broadly described and would fit with roles in the workplace, vocational training and university sectors. Having these skills defined allows a program to be accredited as suitable for an professional IT. One of the six SFIA categories is "Skills and quality". This includes six skills definitions, with five from the "Skill management" subcategory and one from "People management". ACS Certified Technologists (CT) are required to be competent in at least one "specialism" at SFIA level 3 and Certified Professionals (CP) at Level 5. Three of the learning related SFIA skills are defined at level 3 (delivery, assessment and evaluation, development management). All six are defined at level 5. This suggests that the lower level skills are: delivery, assessment, evaluation, and development management. The inclusion of learning evaluation as a low level skill is curious. Normally it would be considered that appraisal of a program would be a higher level skill than of individual students. The SFIA Skills Definitions (Assessment Portal, 2016) would not on the face of it appear to relate to what the typical computer student learns or does in the workplace. However, many of the basic skills, such as preparing documents, giving presentations and collecting feedback, are common to IT development and education. A small component of training specifically on learning skills should be sufficient for the typical computer degree graduate to meet the SFIA Level 3 requirements. However, preparing the documentation for this, without the use of a tool, could be onerous. Learning and development management (ETMG): The provision of learning and development processes (including learning management systems) to develop the professional, business and/or technical skills required by the organization. Learning assessment and evaluation (LEDA): The assessment of knowledge, skills and behavior by any means whether formal or informal against capability and qualification frameworks such as SFIA. The evaluation of learning or education programs against defined outcomes. Learning design and development (TMCR): The specification, design, creation, packaging and maintenance of materials and resources for use in learning and development in the workplace or in compulsory, further or higher education. Typically involves the assimilation of information from existing sources, selection and re-presentation in a form suitable to the intended purpose and audience. Includes instructional design, content development, configuration and testing of learning environments, and use of appropriate current technologies such as audio, video, simulation and assessment. May include third party accreditation. Learning delivery (ETDL): The transfer of business and/or technical skills and knowledge and the promotion of professional attitudes in order to facilitate learning and development. Uses a range of techniques, resources and media (which might include eLearning, on-line virtual environments, self-assessment, peer-assisted learning, simulation, and other current methods). Teaching and subject formation (TEAC): The specification, design, development, delivery and assessment of curricula for computing and for information technology (including electronic communication), at any level of the education system from primary through to tertiary (all age ranges) and in the workplace. The topics addressed are those of the fundamental and more advanced areas of computing and the common skills needed to make productive use of computers and IT systems for both computing and IT professionals and competent users of IT based systems including the ideas of computational thinking and the application of computational concepts to everyday and professional life. Special attention is paid to the methods, techniques and pedagogy (the study of being a teacher, tutor or lecturer, and the process of teaching) of computing & IT education. Professional development (PDSV): The facilitation of the professional development of individuals, including initiation, monitoring, review and validation of learning and development plans in line with organizational or business requirements. The counselling of participants in all relevant aspects of their continual professional development. The identification of appropriate learning/development resources. Liaison with internal and external training providers. Training Tech Professionals to Teach: Part 1, why? A few weeks ago I finished a semester helping teach project management to university IT students in ANU Techlauncher. I was asked to help due to a shortage of suitably experienced tutors. But where do such IT teachers come from? Ideally, to teach IT you need not only a theoretical knowledge, but practical recent work experience. Teaching does not pay much, but it is rewarding in other ways. Perhaps we could have more IT professionals, trained to teach part time. Financial Times columnist, Lucy Kellaway, recently announced that she is becoming a teacher. She plans to teach school maths in the UK. Lucy called on older business people to do likewise: retire and take up teaching. But perhaps experienced IT professionals need not retire: they could take up higher education teaching part time. As more vocational education and university courses are moving to a blended and on-line mode, this need not involve a long commute to a campus. Part time teachers could teach mostly on-line, with occasional visits to the campus for intensive sessions with students and fellow staff. Lucy Kellaway has helped found Now Teach, to help people have a second career as teachers. I would be interested to know if something similar exists for the Higher Education sector, to help professionals become part time teachers. "In addition to the full-time academic staff team, ICT schools are strongly encouraged to make use of the expertise of practising professionals in ICT and related fields for guest lecturing and other sessional teaching." In theory it should be easy to recruit professionals as part time university teachers, as you don't need any teaching qualification to teach at university in Australia. However, this can make it a daunting experience. I have seen seasoned professionals who can defend their project in front of a hostile board of directors, but wilt when faced with a classroom of students. Also as teaching moves on-line, more skills than just being able to get up and talk for fifty minutes are be needed. If an organization doesn't exist, then perhaps one needs to be started. This could focus on IT and related STEM areas, for vocational education and training (VET) and university teaching. It could provide an on-line program to help new teachers with teaching, particularly in how to use on-line and flipped/blended modes. First I thought I would look at what would be a suitable set of qualifications for such teachers and what funding would be available for them to learn. Such teachers might be triple qualified: meeting the requirements of their discipline for professional skills (teaching is a recognized skill an IT professional), requirements for vocational trainers and university academics. As far as I am aware no courses exist in Australia to address the training requirements of the IT profession. Courses do exist for vocational an university teaching, but these are in separate programs.